For The Love of Dogs, LLC Rated One of the Best Pet Sitting Services in CT is hiring! Looking for Pet Care Specialist for overnight pet care in clients' homes, daily dog walkers in Hamden and weekend pet sitters. 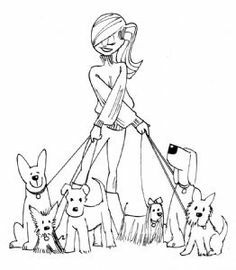 Dog walkers/sitters must be comfortable attending meet and greets, which are essentially interviews, for new dog walking and pet sitting jobs. Walkers/sitters must respect the confidentiality inherent in working inside client's personal homes and follow pet care instructions. Walkers/sitters must also be comfortable referring to existing client care notes and filling in for Pet Care team members that are unable to service a primary client. A window of time will be given to dog walkers marking arrival times for dog walking visits. This is typically a 2 to 3-hour window during mid-day or evening hours. Dog walking visits can range in length from 15-minute potty breaks to 45-minute walks. On occasion dog walkers may only have one walk scheduled in a day. Walkers/sitters must be willing to take on all types of assignments. With the exception of overnight pet sitting jobs Those will be covered by our Professional Overnight Sitters. Time will be spent walking/exercising dogs, and ensuring potty breaks are occurring. These visits include refreshing water, wiping paws and giving treats are also included. All dogs must be kept on leash on walks. Walkers/sitters will only be walking multiple dogs if they are from the same family or part of a requested social pairing. Even when it is raining or snowing dogs need to go out. Walkers/sitters must have rain/snow gear and feel comfortable driving/walking in the rain/snow. Occasionally clients are home sick or working from home. Walkers/ sitters must be comfortable entering homes when clients are home. Walkers/sitters must be comfortable checking in and working with with our office staff and Online Management Software. This helps us ensure everything has been completed to client specifications. Staff members are GPS tracked at client visits. Walkers/sitters will also be required to leave detailed visit notes inclusive of photos and/or videos via our Online Management Software, text messages or emails pet clients request. Walkers/sitters must have a smart phone. Walkers/sitters must be comfortable using an iPad on the job. Walkers/sitters must take responsibility for all keys and equipment assigned to them. Due to the bonding that occurs between our staff members and the pets in their care, we request that employees try to make a commitment to working with For The Love of Dogs, LLC for ONE YEAR This request is not intended to change the traditional relationship of employment at will. If you accept the requirements and responsibilities outlined above, please fill out our Online Application for Employment.